Thinking about adopting a rabbit? Perhaps you’ve just adopted your first rabbit, or maybe you already have a rabbit and would like more information to help you understand your pet better. Rabbits are intelligent, social animals who need affection and they can become wonderful companion animals if given a chance to interact with their human families. The House Rabbit Society or HRS is a national non-profit animal welfare organization based in California. Over the past 20 years, HRS has grown from 300 to more than 8,000 members, with local chapters and educators in over 30 states. The House Rabbit Society for DC, MD, and VA serves Frederick County, MD. This website contains information concerning domestic/wild rabbits and their care. Included is information about adopting, fostering, volunteering and other resources that can be locally accessed. * Through the fostering program, volunteers rescue abandoned rabbits and find permanent adoptive homes for them. * Through education, they seek to reduce the number of unwanted rabbits — and to improve bunnies’ lives — by helping people better understand these often misunderstood companion animals. Here at Kingsbrook Animal Hospital, we love our exotics, and have treated them for the 15 years we have been in business. Our veterinarians treat rabbits for preventative care and minor ailments. This entry was posted in Frederick MD, Kingsbrook Animal Hospital, veterinarian on August 25, 2014 by yourfriends. Leopard geckos can live their entire lives happily in a 10-20 gallon aquarium. Too large of a tank can actually inhibit the gecko from being at the appropriate temperature. Newspaper, pea gravel, or flat stones work best as bedding. Reptile carpet is also an excellent substrate that can be easily washed once dirty. Sand or particulate bedding tend to cause impactions and can pose a serious health risk. Leopard geckos require a hotspot of 86-90° F, and the cooler side of their tank should be around 75-80° F. This can be done using a heat lamp on one side of the cage. A natural heat gradient will occur to allow your gecko to choose what temperature it wants to be at any time. Heat rocks are not recommended because they can get too hot and burn your gecko. Leopard geckos prefer hide spots in their tank. There are plenty of ornate hide spots that will spice up your gecko’s cage. For leopard geckos, crickets are best for feeding. They should be dusted with a calcium/vitamin D3 powder every other day to help with bone growth. 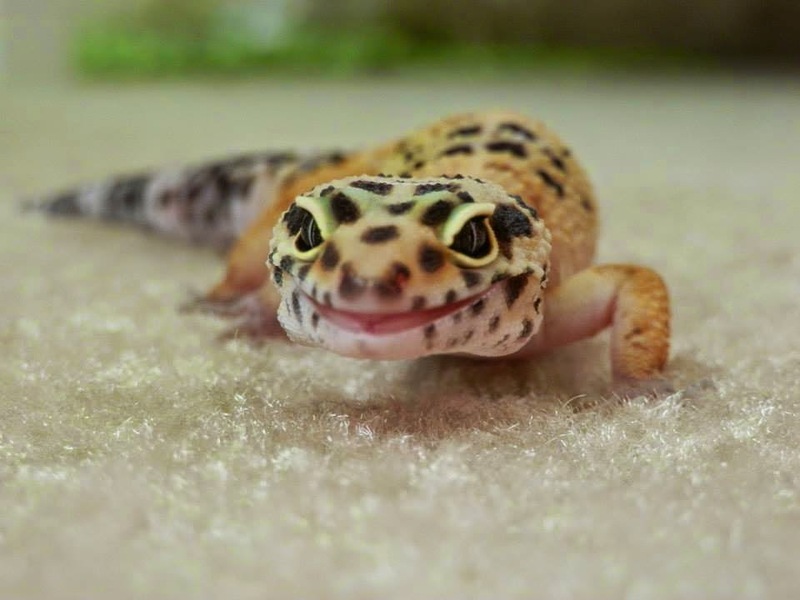 Leopard geckoes should also have their food dusted with a multivitamin once weekly. Zoo Med makes ideal products for ensuring your gecko has enough nutrients in his or her diet. A small amount should be readily available in a dish for the gecko at all times. A good feeding guideline is to feed 2 insects for every inch of the animal’s total body length every other day. Fresh water should be available at all times for your gecko. He/she might also require soaking in lukewarm water every couple days when they are in shed. Retained sheds can cause deformities in leopard geckos, so when your gecko goes into shed, which is marked by a dulling of their color, that they have moisture available or are sprayed with water at least once daily until they have shed their skin. Retained sheds can sometimes be removed after soaking your gecko in some lukewarm water. You should contact Kingsbrook Animal Hospital in Frederick, MD if you think your gecko is having any eye problems or impactions, as these can become very serious health risks an should be addressed by a veterinarian. This entry was posted in Frederick MD, Kingsbrook Animal Hospital, veterinarian on August 21, 2014 by yourfriends. Young bearded dragons can be in a 20 gallon aquarium, and adults should be in a 40-55 gallon aquarium. The ideal substrate for young bearded dragons is newspaper, pea gravel, or flat stones. Reptile carpet is also an excellent substrate that can be easily washed once dirty. Sand or particulate bedding tend to cause impactions, and these lizards have a tendency to be curious and can eat bedding. Adult bearded dragons can pass particulate bedding better than the younger ones, but it can still pose a problem. Bearded dragons require a heat source at all times. The cage should have a hotspot of 95-102°F and the cooler side of their tank to be 80-85°F. This can be done using a heat lamp on one side of the cage. A natural heat gradient will occur and your bearded dragon can choose what temperature he/she would like to be at any given time. A heat rock is not recommended because often they get too warm and will actually cause burns. Bearded dragons require full-spectrum lighting for 12-14 hours each day. Your local pet store will likely have automatic light timers that can turn the light on and off for your convenience. Bearded dragons will climb if given the chance, so they can have any number of fun tank decorations to interact with. Bearded dragons have some variety to their diet. These lizards require veggies in their diet daily. Dandelion greens, mustard greens, collard greens, and bok-choy are great choices in greens that should be offered often. They should be shredded into small pieces before being placed in a dish in your dragon’s cage. Any variety of squash, green beans, sweet potato, or parsnip can be good occasional vegetables for your bearded dragon. Young bearded dragons should be offered roughly 50 crickets that are no larger than the space between their eyes per day. Adults can occasionally be offered crickets dusted with calcium/vitamin D3 powder or multivitamin, roughly 2-3 times per week, to make a total of 50 crickets weekly. Zoo-Med has wonderful products to ensure the proper nutrients for your bearded dragon. Bearded dragons acquire most of their water through their food or through bathing. Placing your lizard in a sink or bathtub with some water in it to a level that they can stand in is ideal. This should be done 2-3 times per week for about 15 minutes. Bearded dragons love the water but will often defecate in it so make sure your dragon is soaking in an easily cleaned area! These baths will also help them shed easier when growing. If your bearded dragon is acting abnormal, has diarrhea or is not defecating, has loss of energy, or swelling of its limbs, contact Kingsbrook Animal Hospital in Frederick, MD right away. These can be signs of various diseases and should be addressed by a veterinarian. This entry was posted in Frederick MD, Kingsbrook Animal Hospital, veterinarian on August 18, 2014 by yourfriends. KAH’s assistant, Sam’s guinea pigs Roderick and Hawke. If you are looking to adopt a small animal, such as a gerbil, guinea pig, chinchilla, mouse, hamster, or rat look no further than Small Angels Rescue. Founded in the fall of 2003, Small Angels Rescue is based out of Frederick, Maryland, and assists animal shelters in the greater Washington D.C., metropolitan area. Since October of 2003, Small Angels has rescued over 2,000 animals and they adopt out about 40 animals per month. Small Angels gives priority to animals that are scheduled to be euthanized, giving them another chance at finding a loving home. Small Angels is only composed of volunteers (they have no paid staff) that are all dedicated to the care and adoption of their furry little fosters. They do not have a shelter and are reliant on fosters to house their many animals. Consequently, they are always looking for fosters. 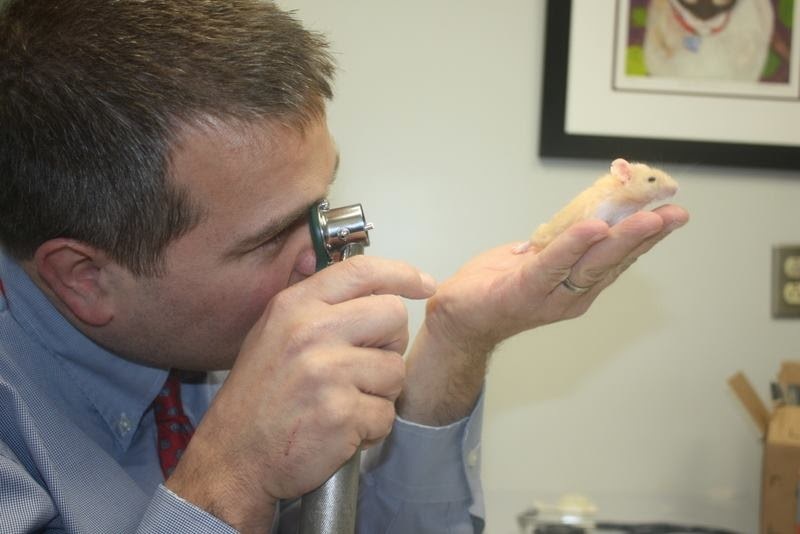 Dr. Davis examining Geronimo the mouse. Fosters provide the animals with the daily care they require, as well as socialization and veterinary care, if needed. In return, Small Angels provides full coverage of approved medical expenses, cages and supplies, as needed, free and discounted food and bedding, as well as a free membership. Small Angels does their best to find their adopters an animal that fits their lifestyle. Although they do not have a shelter for you to visit the animals, they have regular adoption events at the Frederick Petco every other Saturday from 10 am to noon. Don’t forget, if you decide to adopt an animal from Small Angels Rescue, our veterinarians here at Kingsbrook Animal Hospital see all kinds of exotics! If you are interested in becoming a foster, adopting an animal, or you want more information- CLICK HERE! This entry was posted in Frederick MD, Kingsbrook Animal Hospital, veterinarian on August 11, 2014 by yourfriends. There are dozens of bird diets to choose from in the Frederick, MD area with all of the local pet supply stores at hand. Bird diets are even available from on-line stores, or you may read about what to feed on a bird forum from another bird owner, but not all diets that are available are nutritionally complete. Feeding your bird a diet that does not provide the nutrients your bird needs will lead to deficits that may land your bird in a veterinary hospital (literally!). Most diets that are sold for birds are seed based, which birds love! However, seeds are the equivalent of junk food, which is why birds love seed so much and if consumed in excess can cause serious health issues. Seeds and nuts are deficient in vitamin A, calcium, minerals, and certain kinds of amino acids birds need to live long, healthy lives. Nutritional deficits can cause dull feathers, dry skin, an over-grown beak and nails, sneezing, abnormal stool, weight concerns, and a number of other serious health concerns. The best way to make sure you are feeding your bird a diet that is nutritionally balanced is to feed a diet that has been analyzed by an avian nutritionist. By doing so, you are ensuring the diet provides the proper balance of nutrients, including proteins, fats, carbohydrates, vitamins, and minerals. At Kingsbrook Animal Hospital, we recommend the Harrison’s Bird Diets because we know that it is a good, formulated diet that will provide what your bird needs. Feeding your bird a nutritionally complete diet will ensure your bird lives a long, healthful life. This entry was posted in Frederick MD, Kingsbrook Animal Hospital, veterinarian on August 5, 2014 by yourfriends.